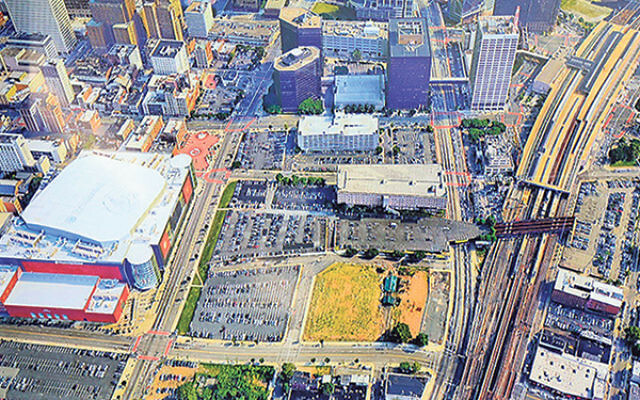 Aerial photograph of the downtown Newark area to be converted into Triangle Park. Thanks in large part to the philanthropy of Jewish community benefactor Jerry Gottesman of Morristown, 22 acres in downtown Newark will undergo a much-needed refurbishment. The area targeted for renovation in downtown Newark is an area that is partly vacant and the site of a parking lot. It directly connects two neighborhoods that are divided by a state highway and active commuter train tracks. 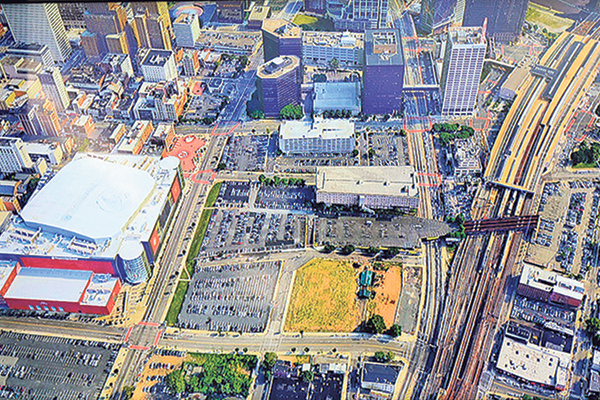 Once renovated, the area — which will be known as Triangle Park — will include open spaces, park areas, commercial and residential buildings, and a footbridge providing access to Peter Francisco Park in the Ironbound section of the city, the Prudential Center Arena, and Newark Penn Station. The project will be built under the auspices of Newark’s municipal government through financing by Gottesman’s Edison Properties, Prudential Center, the New Jersey Devils professional hockey team, and J&L Parking Corporation. Much of the donated tract of land belongs to Edison Properties. Announcement of the project came at a City Hall press conference on March 9. Gottesman and his wife, Paula, have been longtime contributors to the Jewish Federation of Greater MetroWest NJ and its forerunners as well as other Jewish community philanthropies. Among their largest donations was a $15 million challenge gift from the Paula and Jerry Gottesman Family Supporting Foundation of the Jewish Community Foundation of Greater MetroWest NJ, which resulted in changing the name of the Hebrew Academy of Morris County in Randolph to the Gottesman RTW Academy. The Gottesmans have also been strong supporters of Jewish camping, have endowed a position for a full-time Jewish student director at Vassar College, and helped to underwrite the cost of the religious school at Morristown Jewish Center Beit Yisrael. One part of the Triangle Park project will turn a parking lot owned by Edison Properties into a 2.5-acre park. The Newark Community Economic Development Corporation will manage the design and development of the park’s public open space and the footbridge. “These vital investments will enable the full development potential of Newark’s downtown to be realized,” said Ben Feigenbaum, Edison Properties’ chief operating officer. No details were available on the cost of the project or the amount of Gottesman’s financial contribution. It is expected to be completed in July 2018.